The “splendid” (The Boston Globe) debut novel by the author of Speak. For more than thirty years, William Adair’s faith in life was based on two indisputable principles: the exceptional good looks and athletic talents of his three daughters and the historical status of his family in their Philadelphia suburb. After suffering a stroke, William wakes up in his hospital bed to realize that his world has collapsed: his children are less extraordinary than he had remembered and his family’s notable history has been forgotten. William’s daughters—all tennis champions in their youth—are in decline. Having lost their father’s pride, the three sisters struggle to define themselves. Their mother, whose memory has started to fade, is unable to help them recall the talented girls they used to be. For three generations, a carriage house has stood on the Adair property. Built by William’s grandfather, it was William’s childhood refuge and a sign of the family’s prominence. Now held captive by a neighbor due to a zoning error, the house has decayed beyond recognition and may even be condemned. Rallying to save their father, Diana, Elizabeth, and Isabelle take on the battle for the carriage house that once stood as a symbol of their place in the world. Overcoming misunderstandings and betrayals both deep in the past and painfully new, each of the Adairs ultimately finds a place of forgiveness. The Carriage House is a moving, beautifully wrought debut novel about the complex bonds of siblings, about rebuilding lost lives, and about the saving grace of love. This reading group guide for The Carriage House includes an introduction, discussion questions, ideas for enhancing your book club, and a Q&A with author Louisa Hall. The suggested questions are intended to help your reading group find new and interesting angles and topics for your discussion. We hope that these ideas will enrich your conversation and increase your enjoyment of the book. The Carriage House tells the story of a suburban family struggling to define themselves when their talents fade and the neighborhood turns against them. After suffering a stroke, William Adair wakes up in his hospital bed and realizes his family has changed: his daughters are less extraordinary than he had remembered. For over thirty years, William’s life was grounded on two indisputable principles: his daughters’ exceptional talents and the historical resonance of a carriage house built by his grandfather. Both have begun to collapse. The carriage house, held captive by a neighbor due to a zoning error, has decayed beyond recognition, and the neighborhood association has voted to condemn it. William’s three daughters, all former tennis champions, seem to have lost their confidence in adulthood. And his wife, Margaux, is suffering from dementia. As she forgets who her daughters are, they forget themselves. In order to help their father recover, the Adair daughters take up the battle for the carriage house that once stood as a symbol of their family’s success. Although the house will never be exactly the same, the Adairs discover that the emotions of the past – love, hope, and disappointment – have everything to do with the present. 1. Consider the first scene of The Carriage House, in which William sets out on an optimistic journey to the country club, but suffers a stroke during his daughter Diana’s championship tennis match. What do we learn about the Adair family history during this first chapter? How does William’s sudden change of fortune set the scene for the novel to come? 2. William Faulkner once wrote, “The past isn’t dead. It isn’t even past.” Discuss how the past lives on within The Carriage House. Which of the characters find themselves invested in previous versions of themselves? How far do they go in their efforts to recreate history? 3. The Adair sisters are not particularly close: “Normally they orbited around their father like planets in separate spheres.” (page 16) How has William prevented his daughters from having closer relationships? Does the sisters’ intimacy grow over the course of the novel? 4. Compare the two medical emergencies in The Carriage House: William’s stroke and Izzy’s accident. How does each of these crises affect the Adair family? What moments of honesty emerge? How do these two sudden events compare to the slow trauma of Margaux’s mental decline? 5. Discuss Louise’s attempt to write a novel about the Adair family, using passages from Margaux’s diary. Why does Louise eventually give up on her book? How do you think her version would have differed from The Carriage House, in its form and content? 6. According to Elizabeth, “the saddest thing about being a mother [was] you gave up your right to youngness forever.” (page 80) Consider how each of the women in the novel – Elizabeth, Diana, Isabelle, Margaux, and Adelia – struggles to adapt to adulthood and aging. 7. Discuss the emotions that rule The Carriage House: pride, regret, ambition, and love. Why does a mood of thwarted potential haunt the Adair family? How do they express their disappointment in themselves and in each other? Which characters manage to find creative outlets for their frustrations? 8. Consider the inhabitants of Little Lane, and how they compete for power and influence in the neighborhood. Which of the neighbors drew your sympathy? Which did you find most infuriating? 9. Discuss how Arthur’s presence affects each of the Adair sisters. Why does Elizabeth become more animated when Arthur is around? Why might Izzy feel so comfortable with him? How does Diana manage to overcome her regret over her and Arthur’s shared past? 10. Revisit the dinner party scene at the center of the novel. When does this promising night first go awry? How does this fateful evening serve as a turning point in the novel? 11. Consider how each character evolves over the extended season in Rock Harbor. Who begins to thrive away from home? Which relationships are weakened or strengthened? Were you surprised that Book 2 of the novel moved away from Little Lane? Why or why not? 12. Diana says of the rebuilt carriage house, “it’s the best thing I’ve ever done.” (page 243) How does this sense of accomplishment change her, both emotionally and physically? Do you think rebuilding the carriage house was worth the effort Diana put into it? Why or why not? 13. As Diana and Adelia sit in the carriage house, both find themselves “wishing they could just go home, except that they were already there.” (page 257) Consider what “home” means to Diana and to Adelia. 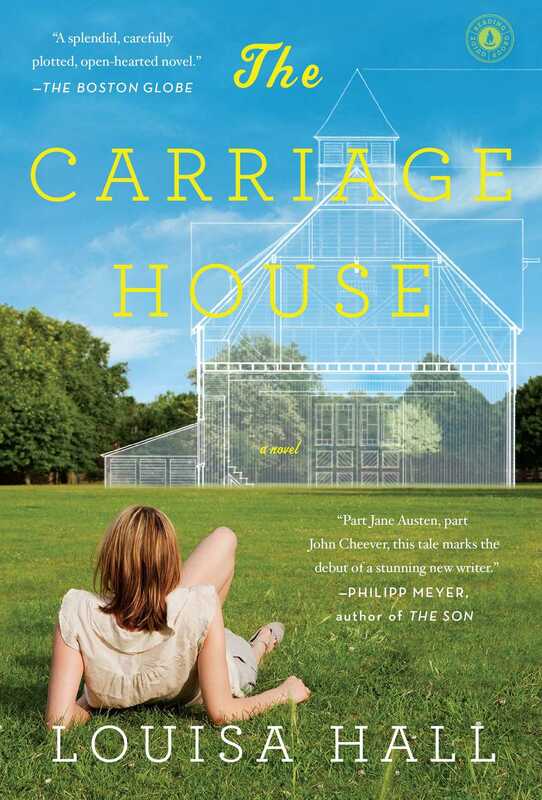 How does the carriage house symbolize an impossible idea of home for each of these characters? 14. Discuss the discoveries, reunions, and resignations at the end of The Carriage House. Which relationships are reaffirmed at the end of the novel? 1. Treat your book club to a movie night and screen Jane Austen’s Persuasion, which inspired the themes of The Carriage House. Choose between two adaptations by the BBC, and enjoy the show! 2. Find a picture of your favorite building – your childhood home, a famous skyscraper, or a design by your favorite architect. Share the picture with your book club, and explain why this building inspires you. 3. To honor Margaux Adair’s passion for gardening, hold your book club meeting in your garden or local park. Or, if the weather won’t cooperate, bring the great outdoors inside with a fresh flower arrangement. 5. Visit the official website of the US Open to revisit some highlights in professional tennis history: http://usta.usopen.org/US-Open/history/. What inspired you to write The Carriage House? A few years ago, when I re-read Jane Austen’s Persuasion, I started thinking about the ways we reconcile different versions of ourselves. Persuasion, is about a young woman who’s forgotten how to be her previous self. Anne Elliot is twenty-eight years old and everything about her has changed. She's lost her looks and her confidence, and she can barely remember how she used to carry herself when she was younger and prettier. At the time, I was also twenty-eight, and I also felt as if I'd wandered out of a previous existence. I grew up a serious athlete and played professional squash for many years; when I left squash to pursue writing, I lost all the markers that I once used to measure myself, like rankings and tournament matches. I became fascinated by the idea of characters who are suspended between two iterations of their lives. The Carriage House was my way of exploring those characters. Reading Persuasion, I felt as if I were inhabiting a manor house composed of many beautiful rooms, through which millions of other readers had wandered. The marriage plot felt as architecturally sound as a sonnet. I structured The Carriage House after Persuasion, taking a proud and privileged family and forcing them to move, in disgrace, out of their ancestral home, while at the same time forcing a fallen heroine to encounter again the lost love of her youth. The Carriage House is my attempt to move a modern family into a beautiful old haunted house and see how they put up with the ghosts. The Carriage House is set in a fictional suburb outside Philadelphia. What is your connection to the Philadelphia area? Breacon is inspired by the suburbs in which I grew up. It’s a privileged, beautiful place plagued by all kinds of snobbery and tribal allegiance. I suspect those things are worse in places where the same families have lived for many generations. When I lived there, I was intensely critical of the elitism and the close-mindedness; now that I live far away, I'm full of nostalgia for the shady streets, the ancient deciduous trees, the green leafiness, the Sunday morning quiet, the kinds of comfort you have in the places where you were a child. Some of my motivation in writing The Carriage House was to explore the ridiculous aspects of certain American suburbs, but mostly I wanted to summon up the incredibly beautiful, dreamy place that composed the substance of my childhood. Recreating those neighborhoods feels as urgent to me as preserving the carriage house feels to William Adair. William Adair is disappointed with the choices his grown children have made. Why did you start thinking about parents’ aspirations for their children? The desire to make our parents proud is one of the strongest shaping forces in life. For a child – no matter how old – it’s completely crushing to suspect that you have disappointed your parents. The popularity of ‘The Crews Missile’ – that disapproving letter submarine commander Nick Crews wrote to his three adult children – is a good example, I think, of the power a father's disappointment can wield. Some of my favorite works of fiction feature parents who vent their frustration with their children in memorable ways: much of Shakespeare, Jane Austen’s Pride and Prejudice, Persuasion, and Mansfield Park, Saul Bellow’s Seize the Day, Marilynne Robinson's Home, and lots of Philip Roth novels. We live in the thrall of our parents’ pride, and therefore their potential disappointment. Tell us about the role of marriage in THE CARRIAGE HOUSE. I've always loved a good old-fashioned marriage plot. I realize, of course, that its movements can sometimes seem quaint. In a world where divorce is common, a story that ends with a wedding doesn’t feel all that conclusive. But the traditional marriage plot provides plenty of ways to get rid of a spouse. You can lock her up in the attic or you can lock yourself in the study; you can conduct an affair or, as happens quite often, you can get a divorce. Part of the pleasure of marriage plot novels is feeling your way toward the hidden flaws that exist beneath the surface of even the most glittering romances. We no longer think of marriage as a solution to all of life's challenges, but neither did Austen, Tolstoy, Wharton or James. Just because Austen ends her novels with weddings does not mean that the problems of the world have been solved, or even that the marriage in question will be either happy or long. Marriage wasn’t all roses in the nineteenth-century either. But still, a lot of people get married if they're permitted to do so, and a lot of people dare to believe their marriage will last forever. Do you see much of yourself in Diana Adair? Diana may have started as a recombination of Anne Elliot and me, but she became more and more her own person as she progressed through the plot. By the end, she was a little surprising to me, which was nice. Diana couldn’t be a replica of me; we’ve lived different narratives. I never moved back to my family home, my father isn’t vain or nostalgic, I don’t have a mother with dementia, I don't have a third sister, and the guy I dated in high school hasn’t spoken to me since we graduated. Diana may have started out with aspects of my personality, but in the end she became a unique blend of my intentions and her development. Margaux Adair is diagnosed with early onset Alzheimer’s disease. Was it a challenge to depict a character with Alzheimer’s? Margaux was the hardest character for me to write. I’ve never wanted to write a character with a diagnosed illness. A novel should allow a character to proliferate until he or she is impossible to pin down; diagnosis pins a character down to a single disease. But Margaux’s disease blurs with her personality, to the point that no one in her family knows when she crossed the official line between health and illness. All the characters in The Carriage House are afflicted with memory problems--some remember too much, some remember too little, some remember too fiercely and some remember with too little feeling. Margaux’s memory loss has been diagnosed, but her family members continue to wonder if her failure to remember them is a result of her disease, or a choice she has made to detach herself from the family. That state of doubt is, I think, one of the challenges in caring for a person with any kind of mental illness. When a condition isn’t physically manifest, it's hard to understand its boundaries. It was important for me to study the scientific facts about Alzheimer's, and to know its neurological underpinnings, but it was the area of doubt around the disease that made Margaux compelling to me. Louisa Hall grew up in Philadelphia. 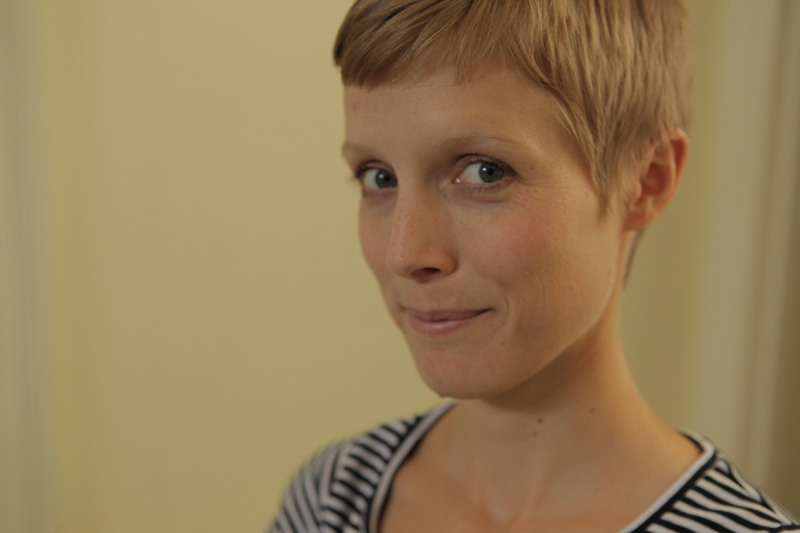 She is the author of the novels Trinity, Speak, and The Carriage House, and her poems have been published in The New Republic, Southwest Review, and other journals. She is a professor at the University of Iowa, and the Western Writer in Residence at Montana State University. “[A] marvelously mature debut…Hall displays a Whartonian malice…[and] seamlessly transitions among the many individual points of view…The novel’s technical proficiency and its gratifyingly nuanced ending make it easy to recommend." "Graceful prose... The themes of memory and nostalgia threading through the novel are especially resonant." "Louisa Hall writes about the wars waged between neighbors and family members with extraordinary sympathy and a keen sense of humor. Part Jane Austen, part John Cheever, this tale of upheaval in a suburban Philadelphia household marks the debut of a stunning new writer."